After our late date night Saturday night, we slept in on Saturday morning. We slept in. It was after 8:30 when we woke up. Jake wanted to sleep later. But really, we needed to get to breakfast. From the moment we got up, I was glad I'd agreed to take the day off. 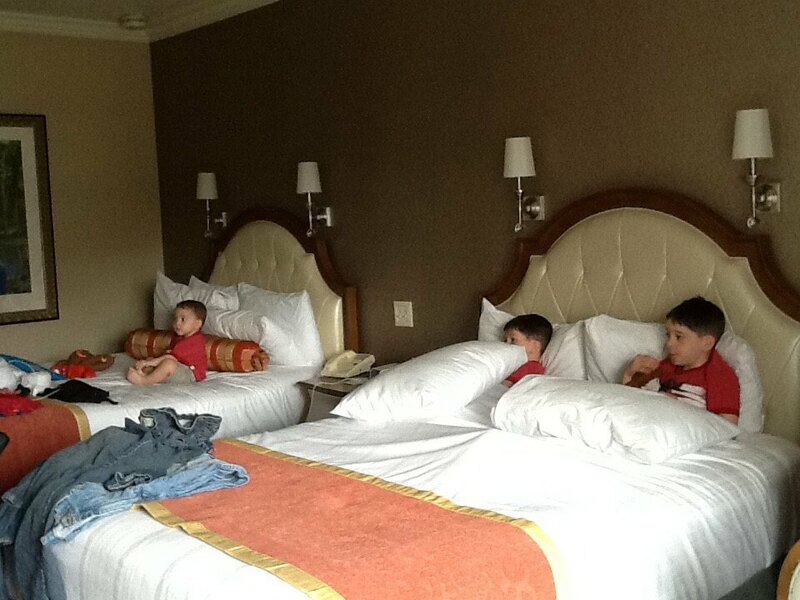 The day before, Christopher pointed out that we had yet to go swimming at the hotel. So we thought, meh, instead of showers today, we'll just go for a morning swim. So we did. We grabbed a couple cereal bars and coffee, and 'suited up'. We had exactly enough time for a quick half hour swim so that we could come back to the room and get ready for Breakfast. We had Reservations at Ohana at the Polynesian for 10:30. This is Jacob's new trick. 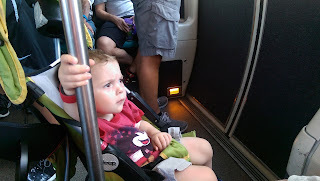 He's got this monorail thing down pat. I'd seen him hold on tight. But on this morning, he got mad at us for not parking him directly next to the pole, and I was so dense it took me an awkward minute to realize he didn't want out of his stroller, but that he wanted to be parked by the pole so he could hang on too. My other sweetboys held on too. 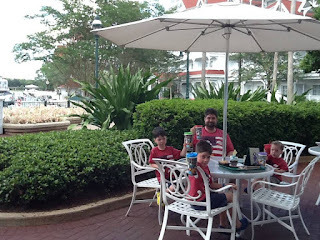 This was our family style breakfast at Ohana. Stitch Waffles, and Stitch juice (not exactly sure the kind of magic they put in that stuff, but it's awesome!) along with biscuits, sausage, eggs, and potatoes. When we ran out, they'd bring us more. It was Wicked. We didn't need lunch. Lilo came around to our table! Then there was a Parade through the restaurant with Lilo. Then Stitch came around for his picture. Jacob gave him the book and pen, and he tried to pick his nose with the pen. Eww. That cracked up the big boys! 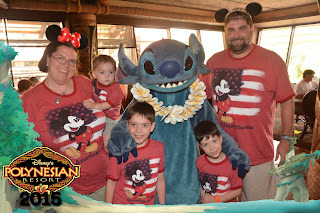 Stitch was Wonderful with the kids. Christopher told us multiple times, he loved this hotel. With our brunch, we had a view over the volcano pool straight to the castle beyond the lake. Hawaiian Mickey made his rounds too. But the boys were getting Goofy, ha ha. Just as we were getting ready to head out, Pluto came and made an appearance. He had to work to get Jacob to cooperate. We tootled around the Polynesian shops for a bit, and it is really neat there. Nope, I would not mind staying there at all! After brunch, we came back to our hotel, the Grand Flo, and suited up again. That was the schedule on this day: sleep, swim, eat, swim, sleep, eat. And a lazy pool day was exactly what was needed. I loved this Sprinkler park, themed all in Alice in Wonderland. But the kids got wet here, and moved on, straight to the big crazy pool behind it. This pool was huge. It was also 3-6 feet deep, which was too much for Jacob and Sam do to on their own. So they didn't have a lot of fun here. Chris did. There was a waterslide, behind the rock fountain, that Daddy and Chris both participated. It was also really noisy. So we didn't last long there. We headed back here. This is our room in the Sago Cay building. From our balcony we could look out on the marina. When we were here on our honeymoon, we were on the other side of the same marina. It's a Beautiful hotel. So calming and relaxing. I'm so happy we took a day to just chill here. I was also pretty happy to have all the Disney channels we could watch. It's good to have trustworthy tv, guarantees that even at naptime, there's a little something for a 'bedtime show'. After naps, we got up and went to dinner at Gasparilla's. Jake was one of the big kids now. We didn't need a stroller to bop around the resort. Big Stuff 1, 2, and 3. This was our dinner. Cheeseburgers, and our refillable soda cups, alongside of the marina. Yeah, this was a tough day. After dark this area fills up with folks wanting to watch the fireworks, but for our early supper, it was perfect, and empty, and quiet, and relaxing. Brilliant to eat at 5, and avoid the crowds. After dinner, we went up and put our suits on again. This time the kids requested the 'quiet pool', the one that had Zero Entry and less noise and people. It's also the same pool that we spent most of our time on our honeymoon, we'd go for a quick swim back then in the heat of the day, back in the day before naps were so absolutely necessary. And we stayed at the pool until the sun set.